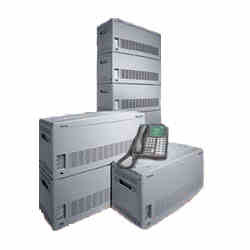 The ultimate, modular, scalable, networkable IP telephone system for your enterprise is the Toshiba Strata CIX 670. It's time to take enterprise-wide communication to a whole new level with the Strata CIX670 - a purebred IP telephone system that integrates voice, data networking, and applications solutions. And one designed to save you money, boost productivity, improve customer service, and deliver a superior return on your investment. Expand up to 672 ports / 264 CO lines. It's an advanced system that supports all IP client devices for all users in all locations, from IP desk telephones and consoles, to wireless IP handsets and soft phones for your notebook PCs and PDAs. Take telephone functionality wherever you leave your desk with a full line of integrated cordless and wireless telephones. Answer incoming customer calls with utmost efficiency with ACD/MIS call center features. It's a practical approach that both protects and maximizes investments in existing telecommunications technology, and provides an easy way to implement new IP-based communication capabilities. Can also be TDM-enabled to support digital telephones and interfaces migrated from other Toshiba systems. The Strata CIX670 was architected to conform to your workplace - not the other way around - while enabling you to grow and add other capabilities in the future. The Strata CIX 670 delivers on the promise of IP telephony by providing all the features and benefits of traditional business communications systems on a converged IP platform. With new, never-before-seen IP-based adaptability capabilities, it is the most efficient, easy-to-use, and customizable telecommunication system available today. Using Toshiba's FeatureFlex adaptability tool, the Toshiba Strata CIX, with the integrated Media Application Server, enables you to tailor your system well beyond standard system and administrative options and basic programmable features. Modify existing features, and create new ones. And not just CIX call processing, but blended features that work between all system applications and resources. This includes voice mail, CTI applications, and more. We install, maintain and supply the complete range of Toshiba Strata CIX products to cater for small, medium and enterprise office solutions. If you would like to find out more please call one of our office team on 08450 515151 for more information.